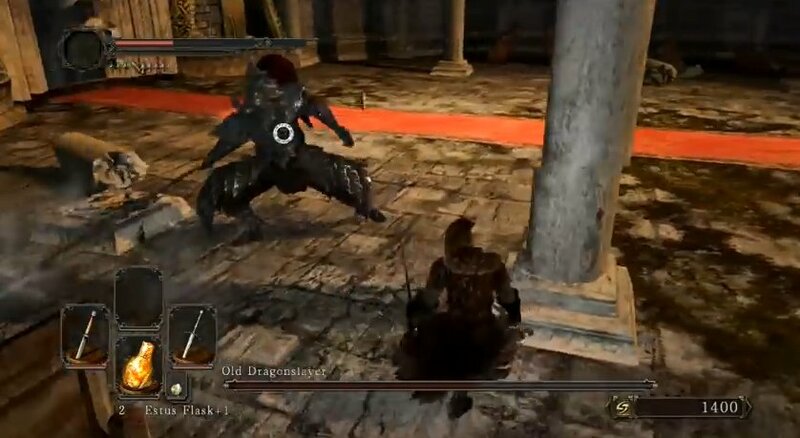 I believe that Old Dragonslayer is the first challenging boss fight in Dark Souls 2, and a welcome change after The Last Giant and the Dragonrider we’ve talked about earlier. I am here to share with you the easiest way to beat Old Dragonslayer in Dark Souls 2, in our growing Boss Fight guide for this great title. So let’s get this started! As I said, beating Old Dragonslayer is a bit more difficult than the other two bosses because he does have a bigger number of attacks, he’s slightly faster and moves a lot. Which is exactly what you should do: always be on the move and stay away from his frontal attacks, trying to get at him from behind and strike him with your sword. Be extremely aware of his special attacks, like the lightning jump and those quick forward attacks, they can drain some life power from you! And always when you enter the area for the fight, he will swipe at you with a powerful attack, make sure you get out of the way! Take advantage of his attacks and the fact that he stands still after performing the heavy ones. That’s the moment to rush at Old Dragonslayer and show him your blade. Combine this with permanent movement from your side, blocking all the attacks that you can’t run away from and you will eventually defeat this boss – the first true challenge of the game! Did you like the Old Dragonslayer boss fight? Let us know by commenting below!